What Do High Achieving Young Workers Earn vs. Others? In our last deep dive into 2013 Current Population Survey data, we examined the total incomes of a demographic group which closely approximated the readers of this site: folks with at least a Bachelor’s degree and working a full time job (defined as 40+ hours reported). Well, to some degree that’s a bit lazy… the majority of readers of this site are actually in their 30s. Our examination lumped people from the age of 25 together with the largest ages in the samples (they are normalized/anonymized) – 85, in this case. This article goes a bit further and gives the breakdown for folks who touched college in the last 15 years – the 25-39 age groups. Refresh your memory with our article about income differences for the general working population and high achieving full time job workers. Here is the same data for all workers over 18 who reported working at least 1 hour weekly, and for all workers over 24 who reported 40+ hours and a Bachelor’s degree. Income refers to ‘total income’ – so all transfer payments, investment income, business income and wage income. We downloaded the CPS microdata from the University of Minnesota’s Minnesota Population Center’s IPUMS-CPS site. Well, if I broke it down by type of income received – as you get older, more and more of that top income comes from investments. Consider that conclusion one: if you want to crack the top decile, you better be investing as you go along. Second… really, this is the same as the last article. Don’t blindly compare yourself to the statistics as presented in general mainsteam financial media. 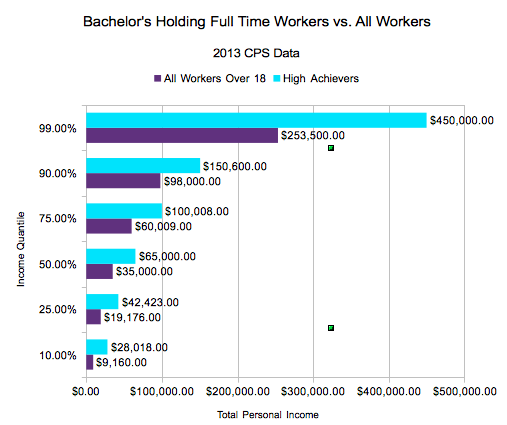 If you have chosen to work a fulltime job, and you’ve earned at least a Bachelor’s degree… well, compare your earnings to other people in the same situation, not to the general population (which lumps in everyone from folks who drop out at the minimum legal age to folks with multiple advanced degrees, as well as people who don’t work with people who work 2 fulltime jobs). It also puts up more realistic numbers for you readers to think about. 29 years old with a Bachelor’s and making $190,000 a year at a 50 hour a week job? Guess what – you’re the 1%, even though it isn’t immediately obvious from looking at aggregate statistics countrywide. It also shows that the median income for a person in this group is huge – remember the overall median household income in 2013 was right around $52,000. The median individual income for a 30-34 year old with a Bachelor’s degree and a fulltime job is around $54,000 – and for a 35-39 year old, a significantly higher $65,288. 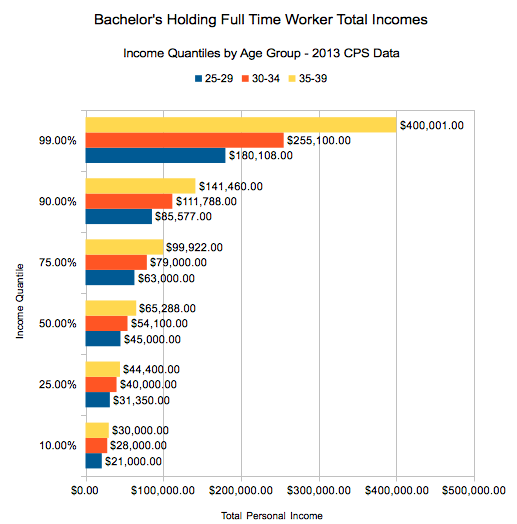 A full (well, almost) quarter of 35-39 year old high achievers crack 6 figure incomes. What do you take away from this data? What did you expect for a difference for High Achieving Young Workers versus the general population? Was the gap what you expected? I wonder if it considers average income or income for a specific year. My income varies year to year. I make a lot when I work but I also don’t work a lot… by choice and also not by choice. It’s the March 2013 CPS survey (the month is carefully chosen because the tax due date is in April so people will have the previous year’s final income in their minds), so you’re looking at salaries for 2012 in this case. I have some interesting article in the queue narrowing it down even further – stay tuned, I promise you’ll enjoy them! It looks like they no longer topcode inctot (personal total income from salary and wages), but they do still topcode the investment income variables. Thanks for noting that – for anyone reading, it’ll make the biggest impact at the top end (I didn’t read the note on the changes). The next time I open the CPS (doing it often lately, it seems! ), I’ll see how many data points it hits.